The American Tourister luggage brand is well known for its reasonably priced quality luggage, aimed towards young and family leisure travelers. The American Tourister company was founded in 1932 and soon became recognized for its affordable quality luggage. They were also well known for their innovations. American Tourister was for example the first luggage manufacturer to make an all vinyl case and they introduced the moulded plastic luggage. The American Tourister luggage company was acquired by Samsonite in 1993 and is the lower-end version of the Samsonite brand. 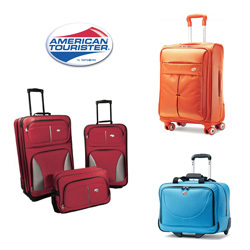 The American Tourister focus today is on affordable quality luggage for young and family leisure travelers. Like Samsonite, American Tourister rigorously tests their products to ensure the best quality. Their multi-step quality control system employs custom-made testing equipment. The products are tested fully loaded in real conditions and really put the American Tourister luggage brand durability, strength, and reliability to the test. The tests include jerking the handles few thousand times, wheeling the loaded bag for long distances to test the wheels endurance, dropping the bag few times, forcefully checking the zippers endurance, and so on. American Tourister style is in line with its target market, i.e. young travelers and family leisure travelers. The bags are colorful and lively, while still suitable for most people taste. The design is also agreeable to most people. We like to describe it as "clean and uncomplicated" and pleasant looking. They say American Tourister has luggage to suit your style and they might be right? American Tourister luggage range is more limited than their sister brand Samsonite. The product range is however true to the target market and consists of practical good-looking affordable quality luggage that appeals to young travelers and families (the American Tourister luggage sets are very popular by young families). B for Bag offers wide range of American Tourister bags and our luggage price comparison will find you the best price our retailers offer. The bottom line is, that the American Tourister luggage brand offer one of the best range of affordable quality luggage.